Punch and crunchy dip packed with super seeds. 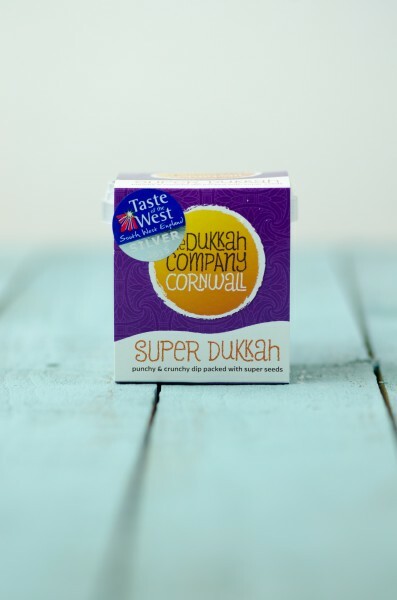 Super Dukkah is the perfect dip to serve with evening drinks. Serve as a dip. Use warm fresh bread, dip into oil and then into the dukkah. Full of nuts, spices and seeds. It’s super nutritious and very tasty. Super Dukkah won silver in the Taste of the West Awards 2015. Ingredients: Seeds (sesame, sunflower, poppy & pumpkin), walnuts, almonds, hazelnuts, peanuts, thyme, coriander, cumin, celery & sea salt.